Many actors wait tables while they're waiting for their big break; May and Ruth Blackburn started a cult. In 1920s Los Angeles, this mother-daughter duo swindled a fortune from their followers while promising them fortune and immortality.&nbsp; Sponsors! Quip - Quip starts at just $25 and if you go to GetQuip.com/CULTS right now, you get your first refill pack for FREE with a quip electric toothbrush. Robinhood - Robinhood is giving listeners of Cults a FREE stock like Apple, Ford, or Sprint to help you build your portfolio. Sign up at Cults.Robinhood.com. The Church of the Almighty God preached that Jesus Christ had been reborn and walked the Earth. She was here to save their souls before the world ended. In 1991, followers scrambled to prove how devoted they were to her before the apocalypse, even if it meant killing in her name. SPONSORS! 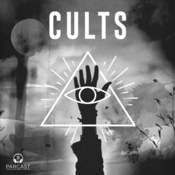 Calm - CULTS listeners get 25% off a Calm Premium subscription at Calm.com/CULTS. CBS All Access - Visit CBS.com/UNEXPLAINED to redeem your FREE trial TODAY. Upstart - Hurry to Upstart.com/CULTS to find out HOW LOW your Upstart rate is. Checking your rate only takes 2 minutes—and won’t affect your credit! When the cult moved to Hawaii, James Baker never expected his penniless followers to find him. But once it became clear that they were willing to follow to the bitter end, he began planning a dramatic exit of epic proportions. Sponsors! CBS All Access - Visit CBS.com/CULTS to redeem your FREE trial TODAY and watch the new Twilight Zone exclusively on CBS All Access. Quip - Quip starts at just $25 and if you go to GetQuip.com/CULTS right now, you get your first refill pack for FREE with a Quip electric toothbrush.